Let me be absolutely, positively, crystal clear before I go any further: I loathe running. I hate it with a fiery revulsion typically witnessed only by four year-olds staring down a bowl full of peas, or Republicans confronted with a full case of “Yes We Can” bumper stickers. To be fair, running doesn’t much like me either. It usually results in a quivering, gasping Puddin, crimson-faced and dripping with sweat. At which point I turn around at the mailbox and go back inside the house to nurse the inevitable shin splints. 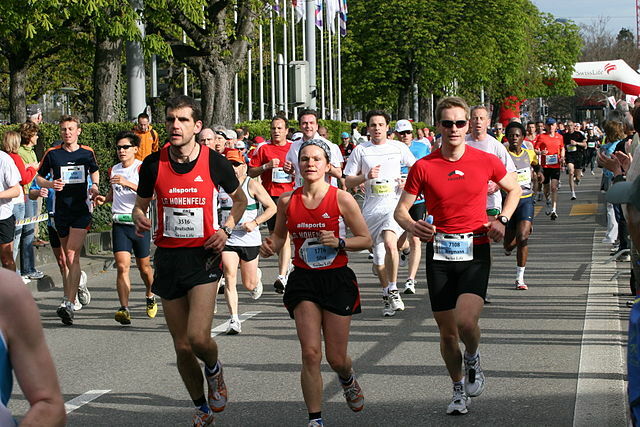 I don’t look like this when I run (image via Wikimedia Commons). It’s pretty much always been this way too. In high school, during my brief 4-month football career, we had to be timed at both at runs of 40-yard and later 1-mile distances. If I recall correctly, at the theoretically peak of my physical fitness, I ran 5.9 second 40-yard dash and something ridiculous like a 12-minute mile. Which is to say, odds are pretty darned good that those green, gloppy aliens from The Simpsons can run a faster mile than yours truly. See? Running has never been my thing. Well, with the exception of a few instances during the kind of truly regrettable night a twenty-something might be familiar with, that is. I’d accidentally be a good half-dozen sheets to the wind at 10:30 on a Saturday night, and finding myself meaning to say, “puppy,” which for some reason kept coming out “poughkipthee.” On such occasions (lo, those many years ago), I was known to have a tendency to start running up and down streets in hopes a little physical activity would correct my diction. You know, because I really wanted to say “puppy.” And not have the spins. Barring those occasions, though, I’ve never liked running. And yet, I’ve decided that come Hell or high water, I’m going to run a half marathon some time in the next 18 months. I know what you’re thinking: “Puddin, Why?” Or, more likely, “Sweet, temporary insanity, Man, that’s crazy talk! What the H-E-DOUBLE HOCKEY STICKS has gotten into you? Well, the thing is that I’m coming up on 40. And if I know anything, I know that It won’t be but the blink of an eye before I’m 50 and sending the kids off to college. After that…you know, like 3 days later…I’ll be 60 and expecting grandkids or something. I’ll probably want to be able to play with them, I reckon, without the inconvenience of getting winded by rolling myself out of my automatic lift chair. Being young and irresponsible with one’s physical fitness is one thing. A twenty year-old body can take a good bit of pounding and still recover. But at twice that age, that recovery part gets to be a little more illusive, especially when one’s been treating his corporeal form more like an amusement park than an cherished temple for four decades. Look, already, my knees whine at me daily, I’ve got a touch of plantar fasciitis that makes getting out of bed every morning a real treat, and I don’t remember what it’s like for my lower back not to be perpetually at least a little sore. Which all goes along pretty well with being a middle-aged guy with a largely sedentary career and a tendency to enjoy life with, um, consumables of questionable nutritive benefits. You might recall that I wrote no less than three posts last week about M & M’s, and I contribute weekly to a beer blog. See what I’m saying? The long and short of it is that I really, really want to go into the older portion of my years like my father, who’s in his 60s and is probably in better physical condition than I am at the moment. He’d argue that he’s falling apart, of course, but the fool was running on a treadmill backwards last week, you know, to stave off boredom. Anybody else think they could pull that off today? If I want to be something even resembling healthy later in life, or rather, if I want to look more like Jack Lalanne and less like Jabba the Hutt when I hit 60, the time to start making changes is the present. That’s not, of course, to say that I’m swearing off either chocolate stouts or dark chocolate M & M’s, which is why it’s time to start getting a good deal more exercise. And I can’t think of a better way to get there than by getting my pudding out of the recliner and into a 5000-meter run. Which, you know sounds a lot more impressive when one’s typical “run” starts with the word “beer”. Once I’ve accomplished that, then I’ll figure out how to stretch that 3.1 miles to 13.1. So, mark it down on your calendars, kids. Puddin’s gonna run a half marathon by February 2014. Your tips and suggestions are obviously welcome. I could probably use some prayers too. And maybe some new shoes. Can you run in steel tips? The only comment this 65 year old has is, “you have chosen the right path grasshopper.” Deny yourself nothing but limit the quantities….running ugh. Consider taking up Judo , I’m sure you look great in a bathrobe (can’t spell ghee); and you have two sons to practice with. Perhaps they could act as Cato. Judo keeps you close and looks so cool in the movies…. Seriously, if you’re set on this run….I have a workable exercise bike we no longer use and it would be ideal for those times you need to shape up for the run without going out in 100 degree temps with 90 per cent humidity. It’s small enough to be moved easily…..just a thought. BTW, the song “Running on Empty” is more or less my anthem. Often it’s playing in my head to keep me moving…..Have you such a tune? I have absolutely no doubt you can do it if you set your mind to it. I took up running a couple years ago to help me kick smoking. I’ve run a couple races (only 5 and 10ks), but I primarily do it to stay healthy and in shape. My advice would be to start slow and don’t push yourself too hard (but DO push yourself some!). I’ve fallen off some recently with the new baby and catching mono a couple months ago, but it was very rewarding to go from barely being able to finish three miles to running 10 miles at under an 8:00 pace. It was a long, long haul to get to that point, but once you’re there, nothing feels better than finishing a nice, long run on a cool, sunny morning. Not to mention, it makes you feel a little less guilty when you eat those M&Ms or have that second (or third) beer. I have seen you do the drunk runs, they are impressive and amusing. Of course not as amusing as you on a trampoline in such a condition. I like your noble goal and I think you can do it. I have been around for such declarations in the past and I now “play” hockey with you so I know you have that sticktoittivness. I would love to join you on such an escapade but my doctor has forbid it. Thank God!!!. Just keep working. Even if you don’t make the whole distance, if you make it past the mailbox you won. Also, I am looking forward to the victory party. We should brew something special for that.